In the last year, I have had increasing issues with stomach pain. Nothing too bad. Yet with increasing frequency. At first, I thought that the increased fiber from a peasant diet was the culprit. I also thought it might be legumes (still properly prepared). So I reduced both and then I had issues with two meat-based meals at restaurants. Another suspect was the high amount of resistant starch I was getting via chilled potatoes. To address that I started re-heating potatoes. I’d feel better for a few days. Then worse. I could not find a pattern, other than the frequency has been increasing. Then a week ago, I may have discovered the trigger. After 25 years of drinking black coffee on an empty stomach with zero issues, I don’t think I can anymore. I’m not 100% certain. More like 60% now. But what happens is my stomach starts gurgling loudly when I drink black coffee first thing in the morning without food. My initial tests have been trying to find the least amount of food I can still consume at 5:30 AM so I can drink coffee. Those tests are not going well. I really do not want to start my eating window this early. An eating window of more than 12 hours almost always leads to weight gain. Plus I am not hungry that early. I just want glorious coffee. I started adding half & half to that first coffee and it seems to help. I am also feeling fuller for much longer after eating. It feels like my digestion is slower. I am at the initial stages of trying to solve this riddle. If you have any experience you can share or tips, please leave a comment. I lost 4 pounds in the last week and I was trying to gain muscle. Not good. Sorry, no insights. Sounds like an annoying issue, but one that should be relatively easy to solve with experimentation. I’ve see “low-acid” grinds of coffee at gourmet markets. Might be interesting to experiment with, but I’m sure you wouldn’t want to limit yourself to those grinds, as your a coffee guy. Separately, what’s the source of that image? Is there a plugin you can add to allow editing of a post by the poster? It would be great to be able to clean up typos. @Jim – Cold brew coffee has less acid, but more caffeine. I do drink that with fewer issues, other than being too wired. I do prefer the acidity, but being pain-free is a priority, so I can change my ways if I need to. Good idea about the Comment Edit. I just installed a plugin to test it out. It has a 5-minute limit, so it won’t affect older comments. You can always email me [email protected] with a link if you want a comment corrected. @Jim – I tested out the Simple Comment Editing plugin and could not get it to work. Typical WordPress. 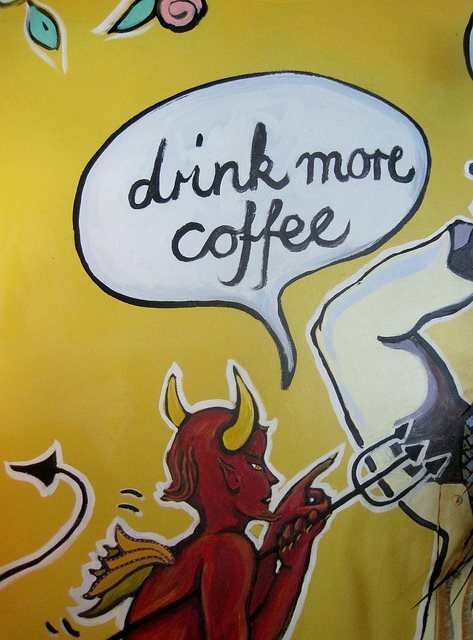 Those images of El Diablo Coffee are extremely amusing. What you are describing sounds very similar to what I experienced. It turned out to be gallstones. Meat/fat will cause the gallbladder to contract, releasing some stones into the common bile duct. What else causes gallbladder contractions, you ask? Coffee, chocolate, and potatoes. My first attacks felt like indigestion. Doc even prescribed Nexium when I told him the symptoms. Over 2-3 years, attacks became worse and more frequent, I still thought it was stomach problems, and some mornings it would occur right after my coffee. A chance conversion made me suspect gallstones, I requested an ultrasound, and bingo! Gallbladder was full of tiny, sand-sized stones. Had my gallbladder out a couple years ago, no more problems. @Tim – Thanks for the idea. I really hope it isn’t that. Half & half is helping me this week. Herbal digestive bitters such as dandelion tincture taken before or after meals can help to improve digestion. It’s cheap and easy to make yourself if you find it works for you. @Lynn – Thanks for the lead, I went to our local herbal store after your comment. They created a custom blend for me to try. @MAS – Telltale signs that it’s gallstones: Starts about 10-20 minutes after eating. A burning sensation in the middle of the stomach/solar plexus. Starts with just a queasy, heartburny feeling gradually gets worse over 10-30 minutes. Pain and discomfort ends abruptly, like with the snap of a finger. Might last 10 minutes, maybe 2 hours. I ignored all this for 2 years as the attacks gradually got worse. The last attack lasted over 24 hours as a stone was lodged in my pancreatic duct. By the time I got to the ER, I was in dire condition and could have died or ruined my pancreas. If any of this sounds familiar, go get an ultrasound to rule out gallstones. @Tim – Not me. Thankfully. No real pain. I’m going to try the herbal remedy and cut out evening ice cream, but I may just visit the doctor. I would drink coffee on an empty stomach for years, and only started experiencing similar issues to you in the past few years. Eventually, I discovered it was my gut lining which was degraded. For 1 month, I started drinking a combo of 3/4 teaspoon marshmallow root powder, 1/2 teaspoon turmeric and 1 peppermint oil capsule- 25 minutes before my coffee. This restored the lining. Now coffee goes down fine. @Gerrard – Thanks. 2 weeks ago, I started marshmallow root + slippery elm before coffee. I’ll look into adding turmeric and peppermint oil too. Awesome! I also have this exact same issue and also cannot seem to figure out what exactly causes it. I seem to get relief from carbonated beverages and also alcohol sometimes such as a vodka and coke. I think it may be something to do with all the yogurt I was eating the greek kind. Lactic acid bacteria seem to cause issues in some people. I think in my case it has to be this, definitely bacteria related. If you have found any relief or got anymore ideas I would really appreciate them. I seem to have very bad gerd and also a very heavy chest and tight throat feeling, super annoying. @Andrew – Based on your last paragraph, it sounds like our issues are different. I wish I could offer wisdom, but I’m still testing ideas myself. Any update on the stomach woes mate? @Andrew – Thanks for asking. I did a post to answer your question.